The DOOP forces preparing for war. The DOOP Army (sometimes known as the Earth Army) is the protector of all members of the Democratic Order of Planets, such as Earth. Its motto is "Join the Army, What Are You Chicken?". The Army is often led by legendary 25 Star General Zapp Brannigan and doesn't seem to care about human life, sending wave after wave of its troops to their deaths on often fruitless missions based on decisions that arguably lack tactical credibility. The DOOP Army generally prefers to wage war against weak, undeveloped or defenseless opponents, such as the pacifists of the Gandhi Nebula, or the "weak and womanlike" Spiderians. Whenever confronted with aggressive and technologically developed enemies, such as the Omicronians or Decapodians, the DOOP Army usually suffers crushing defeats due to Zapp Brannigan's moronic tactics. Men can sign up and drop out at any time, unless, of course, war is declared. Women, however, were forbidden to join the Army before 3008, as they had been known to distract male soldiers, specifically Zapp, with their uniforms. It is likely this restriction has been dropped, though, as two female soldiers are seen on board the Nimbus during the anti-tentacle blockade of Earth. Earthican Robots are implanted with a Patriotism Circuit, which, in case of emergencies, can be activated, forcing them to serve the DOOP Military. 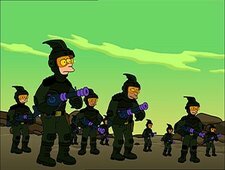 The DOOP Army Soldiers wear green uniforms whilst battling on ground, and red uniforms (similar to those of Zapp and Kif Kroker) whilst fighting in space. The troops also get a 5% discount at Earthican stores. New recruits undergo a rigorous training program, often practicing all afternoon before being sent into battle. The primary assault weapon used for ground troops is the Positron Shooter, a type of ray gun requiring a Jack-In-The-Box style wind-up charging. This charging comes complete with music. The Commander of the Army, Zapp Brannigan, has access to Earth's missiles and other weapons ready to be used during an invasion. The flagship Nimbus is another powerful resource. There are waves and waves of DOOP army members, but these few have played more important roles. Dr. John Zoidberg, former military medic, Private First Class. Hugh Man, a double agent for the Decapodian army. The DOOP Army holds various technological instruments it can use in the course of a war, assets. Though not a piece of military equipment, the Planet Express Ship, along with other civilian spacecraft, was sent into battle alongside the army in the defense of Earth against the Omicronians. The DOOP Army has fought many battles throughout the years. These are its current and former opponents. Pacifists of the Gandhi Nebula. An army of Killbots in the Octillian System. Numerous battles with invaders from Omicron Persei 8. Retiree people of the Assisted Living Nebula. Spheroid defenders on Spheron 1. The Spiderians of Tarantulon 6. The DOOP Army has fought various battles with the Omicronians and the Decapodians, among others. The Battle of the Octillian System. The first Omicronian invasion of Earth. The Battle of Spheron 1. The second Omicronian invasion of Earth. The Decapodian invasion of Earth. The Battle of Tarantulon 6. The Anti-Tentacle Blockade of Earth. The third Omicronian invasion of Earth. The fourth Omicronian invasion of Earth. The Nimbus, flagship of the fleet. One of the DOOP Hovercopters. When the guns are charging, the nursery rhyme Pop Goes the Weasel is played. Soldier: Why is this Godforsaken planet worth dying for? This page was last edited on 11 June 2015, at 22:00.